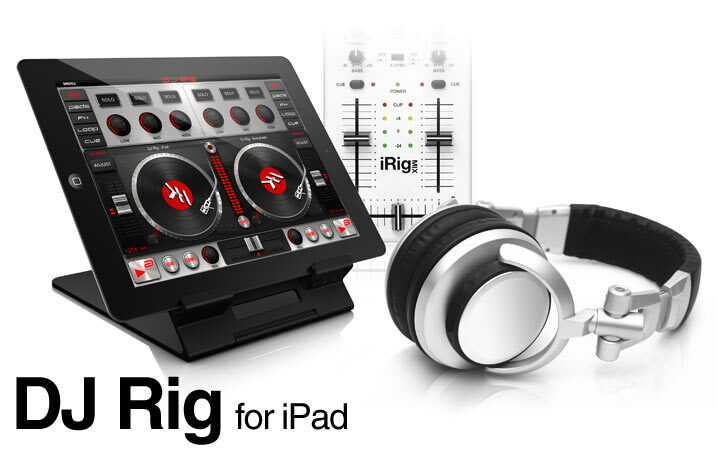 IK Multimedia, the world leader in mobile music-creation apps and accessories, announced today that DJ Rig for iPad® is now available on the App Store. DJ Rig for iPad takes mobile DJ mixing to a completely new level, providing a comprehensive suite of professional DJ mixing tools, all in one convenient iPad app. DJ Rig for iPad greatly expands the feature set from DJ Rig for iPhone, offering numerous new capabilities that previously have only been available on professional DJ software for the Mac and PC. Future DJ is a full-blown DJ software compatible with iPad, iPhone and iPod touch, that you can use to mix for an entire party. Future DJ stands out through features such as automatic BPM detection, beat-matching, seamless looping, powerful sample banks, XY effects pad, MIDI controller compatibility and more, thus making it a complete professional handheld DJ solution. Got 2 minutes to make some noise? DJ Studio is built to help you find – and release – your Inner DJ. The idea is simple: we built a powerful DJ App which requires no skill to use and we packed it full of great Loops & Samples from top Artists & DJs. Then we folded in some advanced features and premium content options which you can unlock at your own pace. The result: you’re officially a DJ! DJ Studio for iPad brings DJ-ing to a different level, for beginners and professionals alike. and tap the Loop button on the deck to engage. and control them from the X/Y pad. iRig MIX, the first ultra-compact DJ and audio mixer for the iPad, iPhone, and the iPod touch is now available and shipping worldwide. When used with an iPad, iPhone or iPod touch, IK’s DJ Rig app and other DJ apps, it is a complete, highly portable DJ system for practicing, rehearsing, performing and recording. DJs can choose either a traditional setup with two devices (one plugged into each of the independent channels) OR a single iOS device. This flexibility, combined with iRig MIX’s portability gives aspiring and pro DJs a compact system that can be used everywhere… anytime. iRig MIX is also versatile enough to provide the perfect mixing solution for solo musicians or small ensembles that use one or more iOS devices to play live. It includes an extra guitar/microphone input that can be processed with other IK popular apps like AmpliTube and VocaLive or any other app that offers real-time audio processing. iRig MIX costs $99.99/€74.99 (excl. tax) and is available now from electronic and music retailers around the world , or direct from the IK Multimedia online store. CrossDJ for iPad was developed by the same professional software team who developed CrossDJ. No other iPad application has ever received such professional expertise and attention to ergonomics and user feedback. Not only complete DJing software, CrossDJ for iPad is also a fully equipped DJing controller. A full 2-channel mixer with 3 bank EQs and kills, preset Loops, 6 Locators, High precision audio FX with X/Y control pad, smart seek and much more are what makes this application a reference in the DJing Market. In addition, CrossDJ for iPad takes advantage of the iPad/iPhone media management paradigm with a fluid, rapid and intuitive browsing and loading. You can access easily all iTunes playlists and filter the media collection using a smart Dynamic Triple Criteria Filter. With CrossDJ for iPad music monitoring is possible thanks to the ‘split Mono’ routing mode. Clean mixes and clear sound is what you are getting with CrossDJ for iPad! MixVibes is proud to present the most exciting DJing application we have ever made: CrossDJ for iPad. MixVibes brings a comprehensive iPad DJing experience with a user friendly yet professional and feature rich layout. This application allows all DJs to enjoy performing quality sounding mixes on an iPad. A complete DJing tool, CrossDJ is a full-fledged DJing controller. It features a full 2-channel mixer with 3-band EQs and Kills, preset Loops, 6 Locators, High-precision audio FX with X/Y control pad and much more. These professional features are what will no doubt make this application a reference in the DJing Market. In addition, CrossDJ takes advantage of the iPad/iPhone media management paradigm with a fluid, rapid and intuitive browsing and loading. You can easily access all iTunes playlists and browse media using a Dynamic Triple Criteria Filter. The audio stream can be split in order to be able to monitor tracks with headphones which is essential for a professional mix. IK Multimedia’s new dance music mixing app, DJ RIG, has not only received an update this week, but has also been released in FREE ‘lite’ version as well, and with the upcoming release of the company’s iRIG MIX DJ mixing controller, now is the time to pick up this app and get some practise in. An upgrade to the full version is available as in-app purchase for $4.99/€3.99 and includes looping, 5 effects (Band Pass Filter, High Pass Filter, Delay, Stutter, Phazer)? and 7 sound banks (Drones, Hoovers, Instrument Hits 1, Stabs 1, Synth 1, Vocals 1, Classic FX). The regular paid version of the DJ Rig app with all these features already included is also available in the iTunes store for the same price. A Pro bundle pack is available for the users of the full version as in-app purchase for $4.99/€3.99 and includes: multiple cues, digital deck skin, 6 effects (Flanger, Comp, Fuzzy, Reverb, Auto Wah, Crush) and 7 Sound Banks (Atmo FX, Animals FX, Instrument Hits 2, Instrument Hits 3, Synth 2, Stabs 2, Vocals 2). Waves and Musicsoft Arts join forces to create Mashup, the first pro DJ iPad app. Technical Grammy® award-winning Waves Audio and Musicsoft Arts join forces to bring you Mashup, the first iPad DJ app made by professionals, for professionals. Featuring an advanced playback engine and effects controlled by an intuitive interface, Mashup lets you play and mix songs directly from your iPad music library and download exclusive tracks from leading DJs like Junior Sanchez, Kris Menace and Jason Nevins. No need to spend thousands of dollars on gear, lug around records, turntables, labtops and mixers. Fire up Mashup, a complete mobile DJ booth, with studio-quality EQ and analog-style resonant filters, Vinyl Touch™ glitch-free scratching, and independent time-stretch and pitch-shift for each of its two stereo decks. From the app store to the dance floor—with Mashup and an iPad, you’ll rock the house. Want to make your Mashup mixes sound even better? Maximize the performance of your headphones and external speakers with MaxxVolume and MaxxBass, powered by the same Technical Grammy® award-winning Waves technologies used by the world’s leading DJs, producers, engineers, and musicians. For loud, clear, steady output levels and enhanced bass response, mash it up with Maxx. MaxxVolume all-in-one dynamics control dramatically increases output levels. MaxxBass psycho-acoustic bass enhancement delivers deep, rich lows you can really feel.